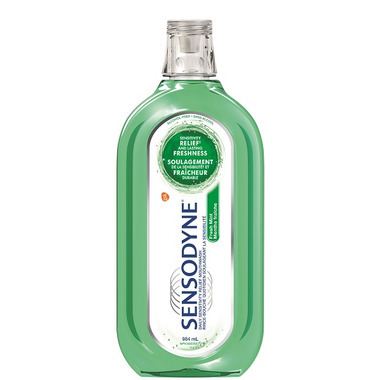 Sensodyne Sensitivity Relief Mouthwash is formulated to relieve the pain of sensitive teeth when used twice daily, following brushing. The mint flavor provides lasting freshness and leaves your mouth feeling clean. Ingredients: MEDICINAL INGREDIENTS: Potassium Nitrate 3.0% w/w, Sodium Fluoride 0.02% w/w (Fluoride 0.009% w/w). NON-MEDICINAL INGREDIENTS: (alpha) Disodium Phosphate, FD&C Blue #1, FD&C Yellow #5, Flavour, Glycerin, Methylparaben, PEG-60 Hydrogenated Castor Oil, Poloxamer 407, Propylparaben, Sodium Benzoate, Sodium Phosphate, Sodium Saccharin, Sorbitol, Water.